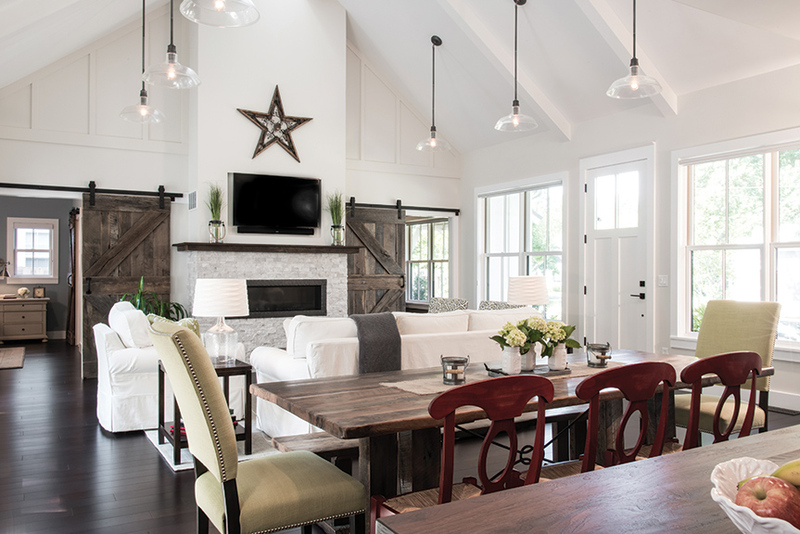 Two empty nesters built a comfortably modern farmhouse perfect for their laid-back lifestyle. After the last of their three children flew the coop, Kathleen and Jack Davis decided it was time to scale back and build the cozy forever home they dreamed of. The pair found an empty lot in Kirkwood three blocks from the lively downtown scene and immediately started envisioning a beautiful bungalow and weekly trips to the Farmer’s Market. 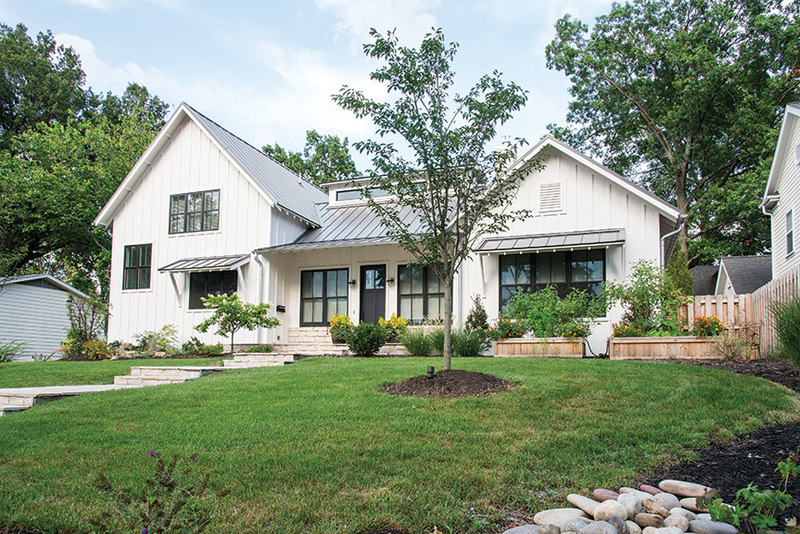 When the Davis duo met the owner of the lot, Monte Herring of Herring Design and Development, their dream quickly changed from a bungalow to a modern farmhouse. Why the sudden change of heart? “Monte had such a strong vision for the home he wanted to build on this property and we just fell in love with his concept of a farmhouse with a modern twist,” explains Kathleen. 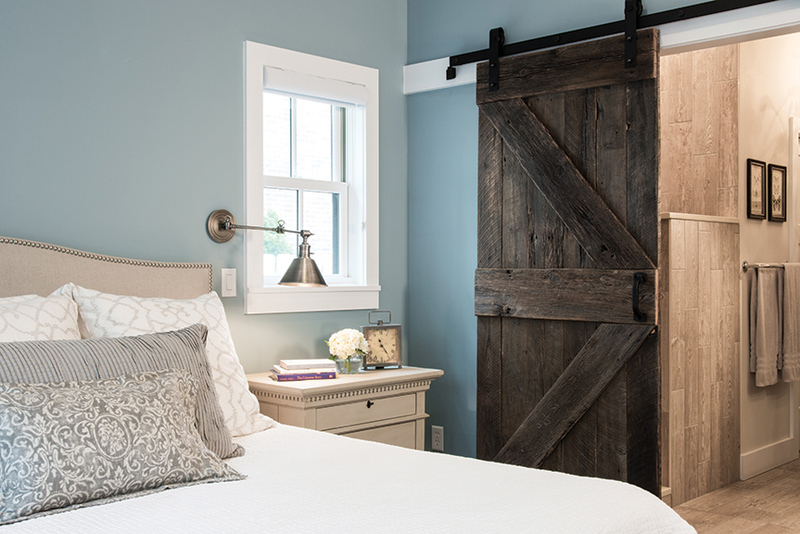 Inspired by the nostalgia of the historic neighborhood and two existing barn-like structures, the homeowners worked with Monte to put together a laundry list of must-haves for their new mainstay. A tin roof, low-maintenance courtyard, vertical siding, open concept and simple style were all important pieces of the proposed plan. “When people drive down the street I think they are shocked to see a little farmhouse in the midst of all of the urban homes and buildings. It’s hard to miss,” laughs Monte. 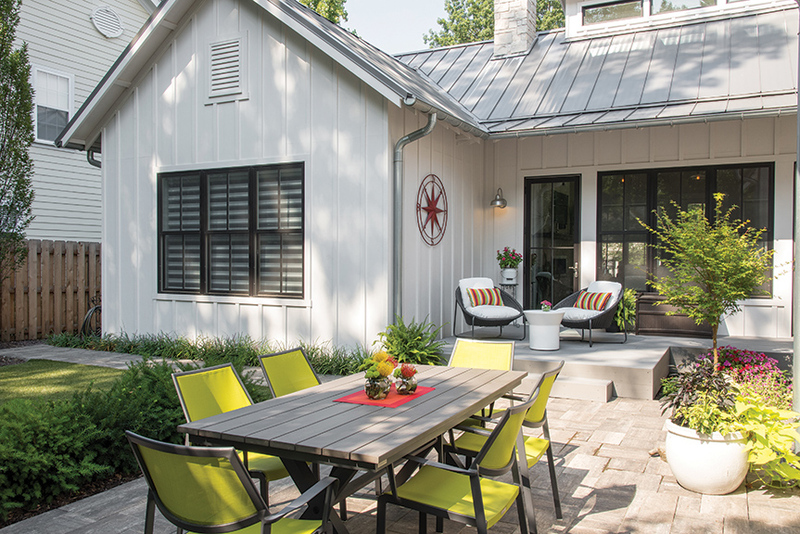 Metal window awnings, stone steps and raised planter beds give the quaint one-story curb appeal, but the white vertical planks that are carried from the outside in is what really turns on the country charm. 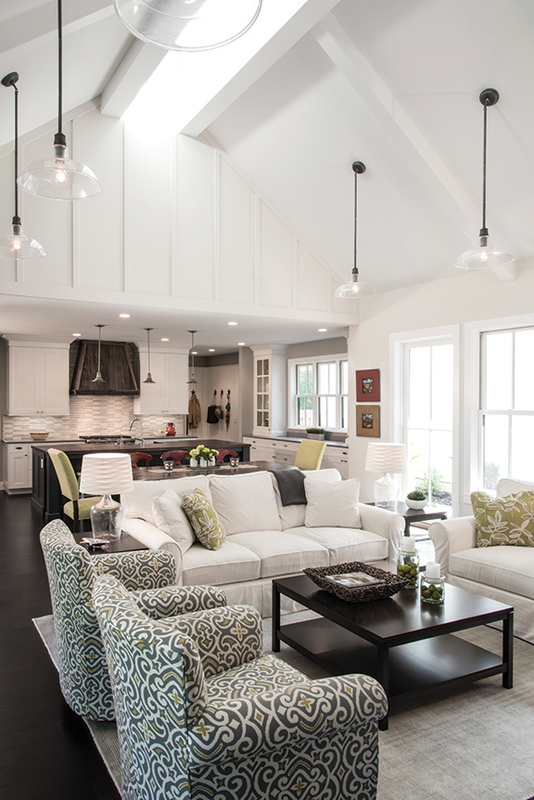 The white-hot interior walls complement the open floor plan of the main living space, keeping it welcoming and bright. A custom farm table from Reclaim Renew, stained to pair with the deep mocha bamboo flooring that covers the entire home, separates the living and dining areas. Mix-and-match chairs and a wood bench around the table provide more seating options when the couple entertains. The kitchen stays true to the trends of the moment, but wouldn’t be complete without a few rustic touches like an oversized wood island with quartz countertops and a hood made from reclaimed wood by Reclaim Renew. The living area’s fluffy white couches and nature-inspired green accent chairs basically beg for you to “kick up your feet and flop down,” especially in front of the stone-tile fireplace with gas firestrip. “We want people to be wowed by the simplicity and of ease our home, so we used soothing colors and kept accessories natural and to a minimum,” Kathleen notes. The master suite, reading room and office above the garage are all just as comfortable and chic as the rest of the home. 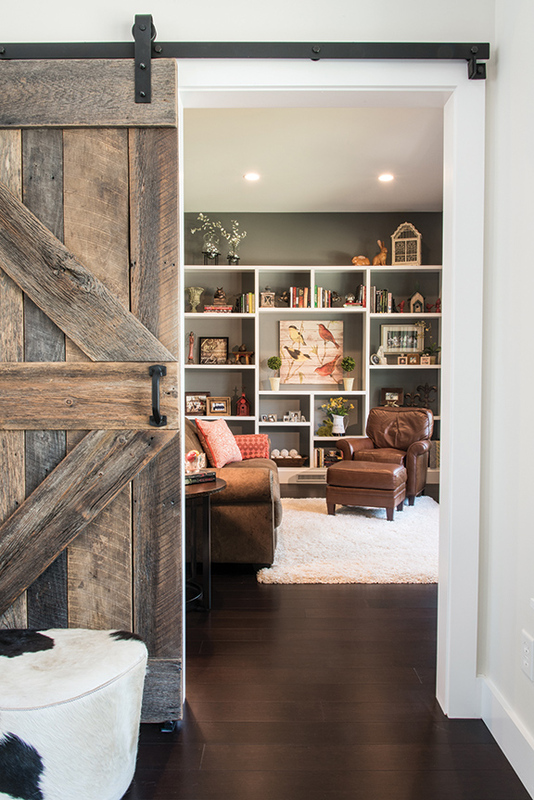 Each space is outfitted in a different neutral hue and features touches of farmhouse elegance like sliding barn wood doors, tile posing as wood in the master bath and a built-in bookshelf spanning the width of an entire wall in the reading room. A quaint courtyard with synthetic turf, bamboo decking and additional room for entertaining echoes the same easy-going atmosphere as the interior of the home and is yet another spot for relaxation at the couple’s farmhouse hideaway. 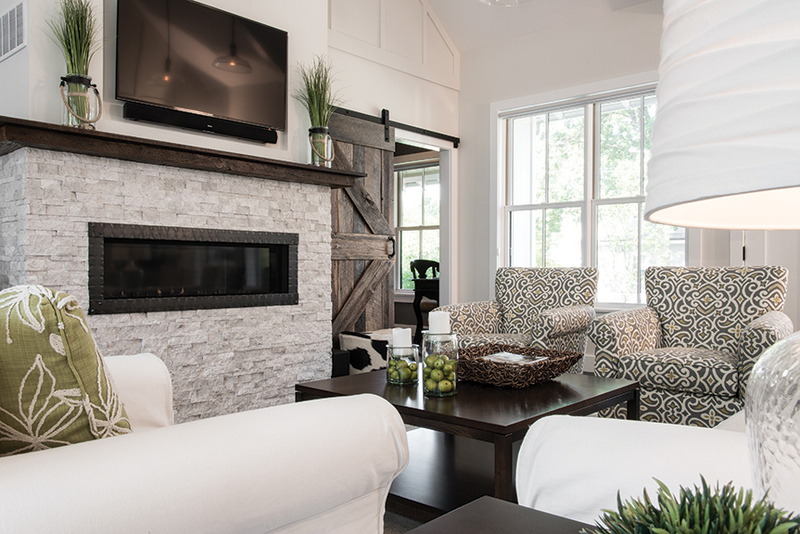 “Together we blended the comfort of country living with contemporary beauty and created not only a one-of-a-kind farmhouse, but a place that truly feels like home to Kathleen and Jack,” says Monte.